Baby crib bumpers are popular items and make a crib look really nice. They are often part of an overall bedding set. Many experts these days are recommending that you do not use a crib bumper including the American Academy of Pediatricians. They are unnecessary and increase the risk of suffocation. It additionally reduces the flow of fresh air around infant and as baby grows, can be used as a step to climb out of the crib. Some parents are concerned about baby’s arms or legs sticking out through crib slats, however, pediatricians feel that this poses much less risk than using a bumper does. If you still feel the need to use a bumper pad, consider one of the mesh crib bumpers that have been newly introduced to the market. They allow for greater airflow around the baby. 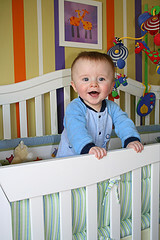 Once can pull himself up, remember to remove all bumpers from the crib.